Happy Friday everyone! I have a picture to share with you today of my uncle in the pair of Jutlands that I made for him during our Jutland Sew-Along. I haven’t seen these pants on him in person as he lives a province away but he reports that they are so comfortable that he didn’t even bother bringing his old favorite pants on a trip to their skiing cabin – the Jutlands sufficed! He reports that the lining is very cozy and is great protection from the mountain-top weather. Categories: Jutland Pants, Jutland Pants Sew-Along, Morgan's Sewing Projects | Tags: Jutland Pants Sew-Along | Permalink. Here’s the latest little addition to the Jutland Sew-Along! I won’t add the Jutland Sew-Along Schedule as the first photo on this post as I clearly am not following it anymore :P. Things have slowed down to a realistic pace because Matt and I are busily prepping for a new pattern release this coming Monday! Welt pockets often have the bad reputation as being scary and difficult to sew. While it might take a little while to make perfectly square corners and until the origami folds become second nature, they really aren’t that difficult…it is just a matter of doing the right step at the right time. And here are all the right steps laid out in photos for you! For these shorts I used the Jutland Pants pattern which includes all necessary pieces. In case you are working with a pants pattern that doesn’t include welt pocket pattern pieces, here are some guidelines to make your own. Welt rectangle – one interfaced rectangle that is about four times the height of your welt and a couple inches wider. Shallow pocket lining – one shallow pocket piece (either shaped like mine is or just a shallow rectangle that is the same width as the welt rectangle) made out of thin cotton or some other pocketing material. Pocket facing – a rectangle approximately the size of your welt piece that will be top-stitched to the deep pocket lining to act as a backdrop for the welt pocket (so that you don’t see the pocketing fabric behind the open welt). Interfacing – A square of interfacing that is larger than your welt rectangle piece to apply to the trousers. Okay, now that we have all of our pieces cut out and interfacing applied, we can begin to assemble the pockets! On the top third of the wrong side of the welt rectangle, mark the finished width and height of your welt (you can choose this based on your preference or use my measurements which were 5/8″ tall X 5 1/2″ wide). If you are sewing the Jutland Pants, you can use the welt template that we’ve provided. Draw markings on your interfaced trouser pieces as well – make sure you mark both the right and wrong side of your pants. 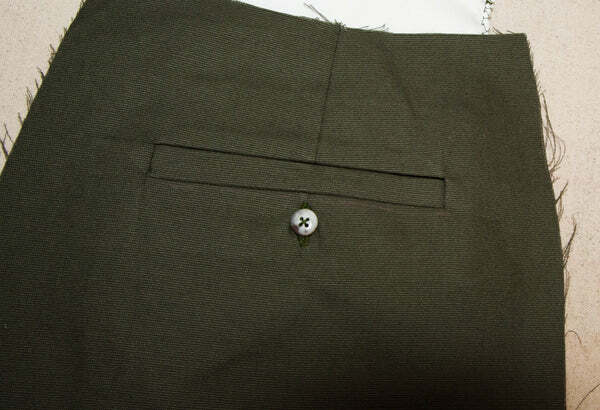 If you are sewing the Jutland Pants, use the provided marks to choose your welt placement. You can use chalk or you can use thread basting to create your markings. Line up your trousers with your welt piece, right sides together. Your markings will come in handy here to make sure everything is lined up precisely. Using a very short stitch length for added strength and precision, stitch along the long edges of the welt rectangle. Stop and back stitch precisely at each corner. Using sharp little scissors, cut along the center of the welt and stop 1/2″ from either end. Cut on a diagonal towards each corner, clipping as close to the stitching as you dare! The closer you get, the crisper your welt corners will appear later on…but be warned – if you snip beyond your stitching your welt will have little holes in each corner! Now is a great time to remove all the basting thread! To reduce bulk later, flip up the bottom of the welt and press the seam allowances that are hidden underneath open. And now press the sides and the top of the welt crisply flat (isn’t linen lovely to press?). If you’d like, you can press the seam slightly towards the wrong side of the garment so that it isn’t visible from the right side. Turn the garment on the right side to press all four corners carefully – you can pinch and pull them a little to make them look perfectly right angled. From the wrong side of the garment, create an accordion fold with the welt rectangle so that the folded edge meets the top of the welt window. Press the folded edge crisply. From the right side of the garment, your welt will look almost finished! To keep the welt in place, uncover the sides of the welt by folding over the trousers. You will see a little triangle of fabric and your accordion fold. Stitch as close to the base of the triangle as possible through all layers except the trousers themselves. Your welt is finished! Now it’s time to add the pocket bag so that it doesn’t open up to display underwear (unless you’ve made yourself some perfect Comox Trunks that you really want to show off :P). To add the pocket bag, first place the shallow pocket lining with right side down on top of the welt. Line up the top pocket edge with the bottom of the welt. Stitch using a 5/8″ seam allowance. 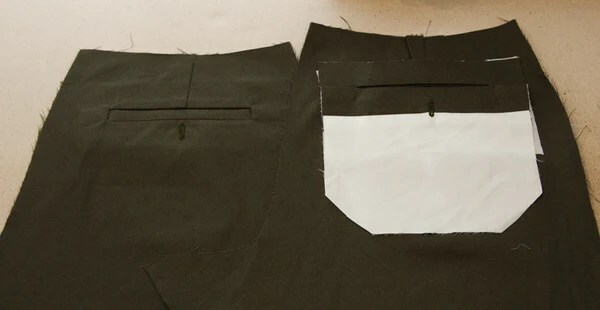 At this point in the welt pocket sewing process, stitch a vertical buttonhole below the welt through the main pants and the single layer of the pocket lining. I stitched mine over the bottom of the Jutland Pants dart. Top stitch the pocket facing to the deep pocket lining. You will want to place this facing so that it lies directly over the welt pocket when the bottom of the deep pocket lining is lined up with the bottom of the shallow pocket lining. Line the pocket pieces up with right sides together and pin in place through all layers of the welt folds (but not through the trousers themselves). Stitch around all pocket edges using a 5/8″ seam allowance. You won’t need to stitch up to the top of the deep pocket lining because no other layers extend this high. Finish the edges of the pocket with a serger or a zig zag stitch. To prevent your welts from sagging in the middle, fold down the top of the trousers to expose the little seam allowance between the trousers and the pocket pieces. Stitch through the seam allowance and all the pocket layers. If you are adding buttons and button holes to your pants, this is the point that you can sew on your button! 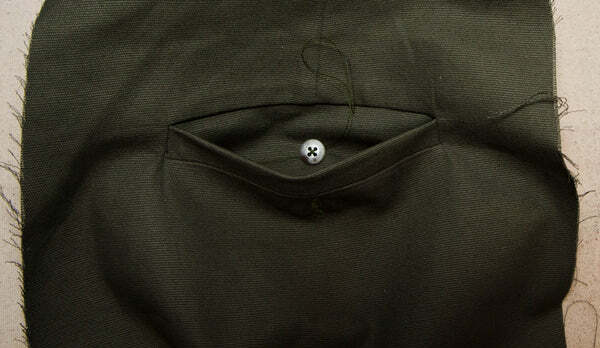 Open up the pocket and position the button directly under the button hole. Now you can add them to just about everything! Categories: Jutland Pants Sew-Along | Tags: Jutland Pants Sew-Along | Permalink. With the Jutland Pants Sew-Along coming up on December 1st, I’ve been doing a lot of thinking about sewing pants. Next week we will be filming the ‘video diary’ so that it is ready for the sew-along start date. In the meantime, here are some of the resources I’ve been referring to while brainstorming and researching before we begin to film! Have you seen Closet Case File’s latest pattern? Heather Lou has put epic amounts of work into this pattern and is currently hosting a sew-along on her blog. I am not usually one for following sew-alongs but this Ginger Jeans Sew-along has got me hooked! Heather has thought of every single question someone might want answers to as they embark on their first pair of jeans. She has beautifully photographed her steps (including how to sew the fly!). I’m glad we haven’t been working on a photographed sew-along because, when it comes to sewing casual pants, Heather’s got your classic sew-along completely and perfectly covered! As I mentioned in the sew-along announcement post, this pair will include a gusset for ultimate flexibility, custom pockets (including a screw-driver pocket), and I hope to adjust the fit of the Jutlands a little to match his favorite Kuhl fit. Speaking of fit, I’ve been planning out some of the alterations I want to show you in our video diary. My favorite fitting guide in my library is a single page in Winifred Aldrich’s Metric Pattern Cutting for Menswear. These fitting adjustments are specifically suited to men (which is hard to find in the sewing world!) and they are presented very simply and clearly. I’ll cover these adjustments in our video as I find it is really helpful to see pattern adjustments in motion rather than photographed or sketched. Since most pattern adjustments involve slashing and pivoting, I think the dynamic format of video will be perfectly suited to explaining these! And last but not least, here’s a little sneak of what our new pup, Luki is up to while I work this afternoon! He’s trying to dry off after a stormy mid-morning walk by snuggling deeply in his (ever-growing) pile of cozy blankets! Happy Friday! Categories: Friday Posts, Jutland Pants, Jutland Pants Sew-Along | Tags: Jutland Pants Sew-Along | Permalink.